I’ve had my eye open for a decent one of these for a long time. Something simple and elegant that lets you load up a range of VST Instruments and layer them across a keyboard for performance and just messing about. 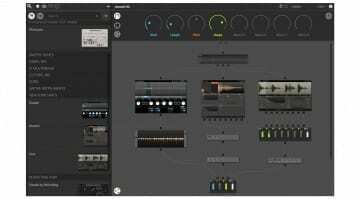 You can do this inside a DAW of course but there’s always been room for something more dedicated and less complicated than that. There are a few freeware “VST Hosts” knocking around with some potential but often terrible interfaces, and there are a couple of premium ones in the shape of Forte and Cantabile but both are long in the tooth now and expensive for what they do. 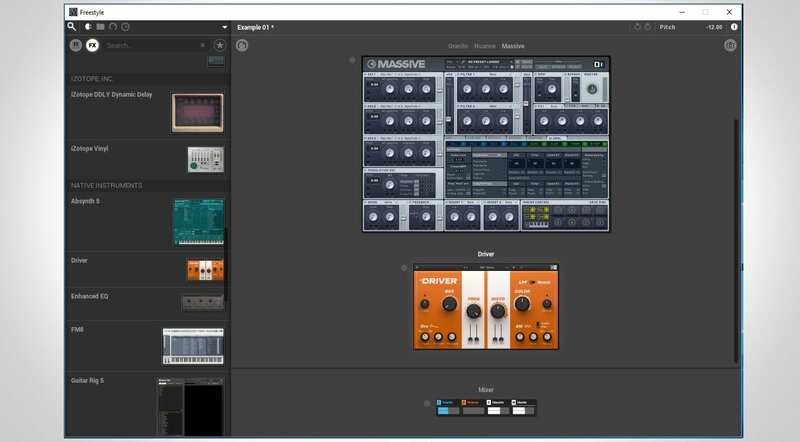 My interest was reignited by the Multi-Instrument feature in version 3 of StudioOne which gave a simple drag and drop interface to the placement and arrangement of virtual instruments into one big combi. The VIP software that comes with Akai Advance keyboards is another great example but it’s tied to those specific keyboards (click here for more information on VIP). So along comes Freestyle from New Sonic Arts and potentially offers exactly what I’ve been waiting for. 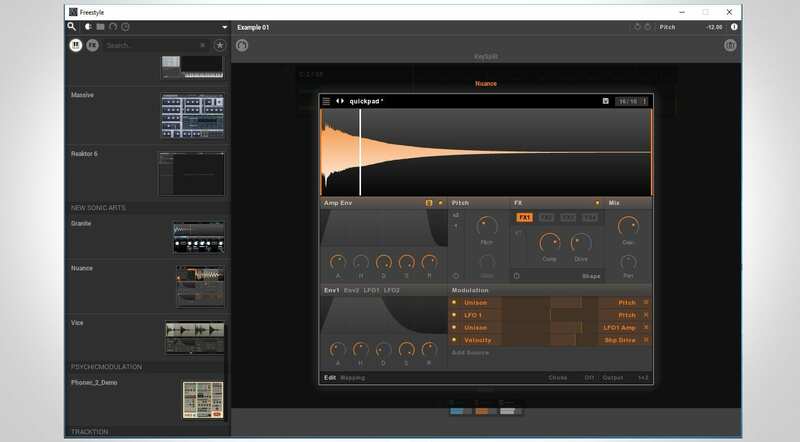 New Sonic Arts have announced their VST Host while it’s still in public beta and would encourage interested people to download the demo and give it a go while they are working towards a final version. Freestyle gives you a dull grey void into which you can drag and drop your instruments and effects. When you kick off the program it scans and pulls thumbnails of each plug-in into the browser on the left. Drag your chosen instrument into the void and it appears as a larger thumbnail ready to play. Click on the thumbnail to bring up the full GUI and off you go. If you drag another instrument next to it they will layer on top of each other so you can play them together. The layering is displayed in what they’re calling a “KeySplit” and you can quickly specify the range over which the instrument will play. Not sure why they went for a numeric display rather than the more helpful display of a keyboard. At the bottom of the screen a little mixer appears that lets you set the relative levels of each loaded instrument. The way the routing works is not immediately clear and I struggled at times with an unexplained loss of sound until I realised what was going on. To run instruments together you drop them side by side – they then disappear into a sort of tabbed view with only the current selected instrument on view. If you drop an instrument above or below – which is easy to do – it then sits in the audio chain and would depend on the instrument below it having an audio input to pass the audio through. In other words that’s not going to work. However, this is how you add audio effects, you drop them in beneath the synth – or beneath the mixer if you want it to effect all the instruments. It’s not particularly clear in the documentation and I had to work it out through trial and error. The other key feature is the 8 macro-control knobs at the top. These can be mapped to anything anywhere. It’s got a really neat learn function which, when enabled, automatically maps the next 8 controls you touch to the 8 knobs – super easy, I like that a lot. 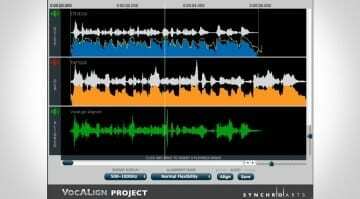 Freestyle appears to come with New Sonic Arts’ sample-based plugins Granite, Nuance and Vice, although these could be just demo versions. They have some additional integration into the interface where the minimised thumbnail view also shows real-time updates – the included effects do the same. 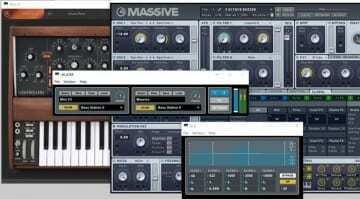 You can also drag and drop samples into the space which are automatically loaded into Nuance. It also says you can drag in presets but I’m not sure how you access them. The layout and appearance of Freestyle is excellent. It looks and feels modern and creative, it’s easy to see what’s going on and I can see how it can be a lot of fun playing with and combining instruments to create your ultimate combi’s. It’s also begging to be touchable but sadly it’s not. Much of the interface reacts badly to finger and the macro knobs fly from minimum to maximum values with the smallest finger move. It’s a shame because if it had touch it would be the perfect application for an All-In-One touchscreen PC, laptop hybrid, tablet or Microsoft Surface – especially in a performance environment. 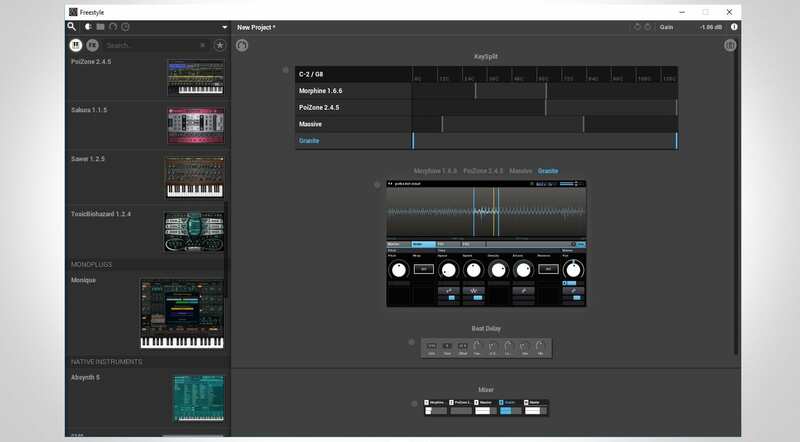 It does have a snapshot facility which can be mapped to MIDI so you can access them without having to grab the mouse or trackpad but come on, touch is way to go with these things. This is still a beta version and I’m sure they have more things to implement in the coming release but this is looking really very promising indeed. 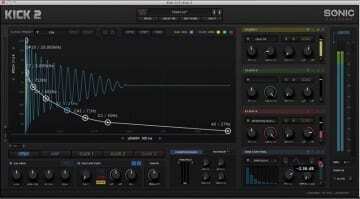 The preorder price is €99 and it will be €129 on release for OSX or Windows, standalone and VST format.